These are some of my graphical works that help promote the well-respected brands of various professionals. I designed this card and printed it on-demand on photo-quality paper with my ink-jet printer. 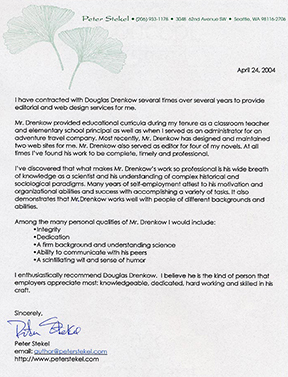 See Steven’s Web site, which I also designed, for his stellar list of accomplishments. At a glance, one can see what Steven’s world-renowned art looks like; the card is a conversation piece! Please click image for full-page copy. Steven distributed these one-sheets — showing various of his paintings with insets of the insect “artists” — at live events featuring his art and other works. Please click image for full-page copy, including some kind comments Peter wrote in endorsement of my work. Peter is a published author who has written in a wide variety of fields but holds dear his background in the natural sciences: As a botanist, he takes special interest in the ginkgo, a “living fossil”; he supplied the drawings of leaves for the letterhead.